Juergen Weichert lets out a slow, deep laugh and pauses for a moment, thinking. I’d just told him of an oversized recumbent tricycle, powered via pedals, I saw streaking down Gladstone the day before last. The thing was doing about 50 km/h and hauling a washing machine in its ample trailer when it blew by me. I’d usually chalk up an apparition like that to a wicked hangover, but not this time. “By bike?” I exclaim, staggered. As it stands I consider moving, even with a sturdy cube van, a task roughly akin to dislodging my own eyelashes. So imagine my surprise. “Yeah,” he answers, adding it’s his friend’s second time moving house – that means tables, chairs, desks, appliances, beds, maybe even the kitchen sink – via human power. The crew, a collection of engineering and aviation graduates, did their first all-bicycle move five years ago and haven’t looked back since. “He was most likely riding a vehicle we built together here in my driveway, in fact,” he continues. Weichert and his friends, some of whom are completely car-free, are all crazy for recumbent bicycles. They’re those low-to-the-ground, slightly ridiculous-looking but oddly practical pedaled contraptions. They’ve even started a downtown-based club, the Human Powered Vehicle Operators of Ottawa (HPVOO), to promote their activity. The club meets every Sunday evening at Vietnam Noodle House on Somerset, following an hour-long ride through downtown. “Here’s the thing,” he says. “We’re sucking tremendous amounts of energy as a society. And we’re exhausting tremendous amounts of carbon dioxide into the atmosphere. “And the forgotten energy source is human power." Weichert’s crew says recumbents are anything but ridiculous; indeed, they maintain the machines could be city-borne road travel’s wave of the future. “It’s much more comfortable to ride, first of all,” says Weichert. The sturdy seat back, he explains, provides ample leverage in which to generate more torque than a typical bike. 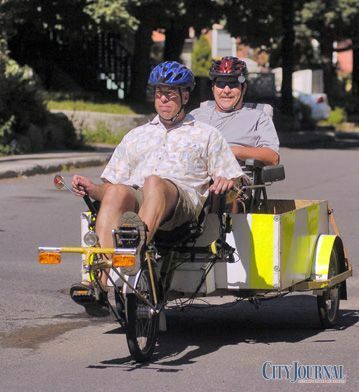 Fast, lightweight and reliable, Weichert says their recumbents – many of which he’s fashioned from welding old conventional bikes together – can tow huge loads and even be fitted with roof racks for carrying a canoe. “After the first human powered move, we realized there could be a need for a bigger trailer than what we had,” recalls Weichert. They sketched out a design for a 1,500-lb. capacity behemoth and welded it up, again, in Weichert’s driveway. “It’s what we call the organ trailer, because we can fit an entire Hammond organ, the organist and the power source,” he says. Councillors have voted to scrap the city's crack-pipe program. Do you agree with this move?